ChuckECheese is a chain of American family entertainment centers offering pizza restaurant services, arcade games and amusement rides. The company is committed to provide excellent foods and great guest experience for both kids and parents. High quality, fresh products and fun to play games are their priorities when it comes to pleasing their customers. No wonder ChuckECheese is known as one of the most popular locations for kids and parents especially because of the discounts and free tokens they can benefit from. Interested how to get ChuckECheese coupons, and enjoy more rewards? Find out everything you need to know in our post, from becoming a ChuckECheese Club member to profiting from different deals and discounts. What are the ChuckECheese Coupons? ChuckECheese coupons are printable vouchers you can redeem in ChuckECheese locations across the United States, except Hawaii. There are either free coupons you receive when purchasing foods and drinks or tokens you can buy to enjoy discounts when you next visit one of their stores. With ChuckECheese you are just a few clicks away other big rewards and savings. All you need to do is become a ChuckECheese Club member, sign up for their exclusive deals and enjoy some quality time with your kids. Before giving you all the indications you need to follow in order to become a member, let’s see what types of ChuckECheese Coupons you can benefit from. 10 to 29 Free Tokens when you buy a pizza and drink. 60 tokens and 200 tickets for $15. ‘All You Can Eat Salad Bar’ – a ChuckECheese coupon allowing to eat as much as you can from their salad bar for a discounted price. Pizza discount when buying a large pizza. 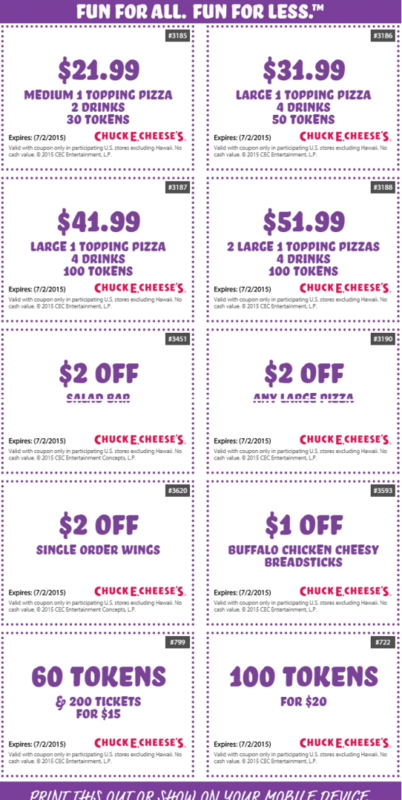 What Other ChuckECheese Coupons and Deals are There for You? If you reserve a birthday party for your kid, ChuckECheese offers you special discounts on food and beverages, as well as bonus tickets and free tokens. Wonder how many free tickets and tokens you can get for your little ones? According to their policy, your boy or girl celebrating his or her birthday can get between 400 and 1000 free tickets and over 15 free tokens, plus other free souvenirs. ChuckECheese not only is committed to provide you with best services and fun, but also to help your kids accomplish daily tasks and goals. That is why they designed rewards calendars where you can establish goals such as doing home chores, cleaning their room, doing their homework. As a reward they get 10 free tokens over a course of two weeks for excellent behavior. If you are looking for a unique way to reward your kid, this is a good choice. Wonder how to get started? 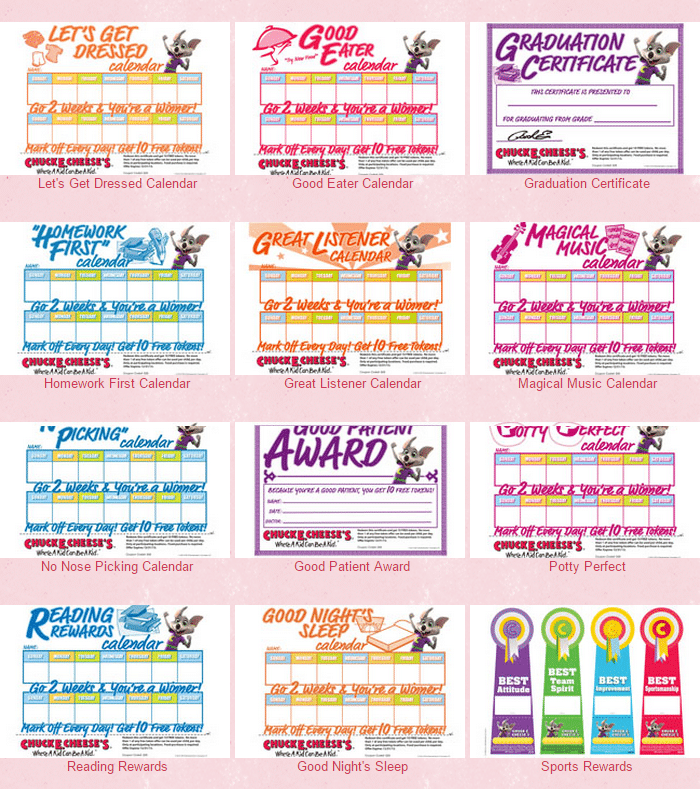 Download and print out the rewards calendars from the ChuckECheese website. Mark the days when your kids has goals to accomplish. Use a pen or a sticker. Bring back the calendar to ChuckECheese to get the 10 free tokens reward. Apart from birthday discounts, ChuckECheese also offers deals for group events. These include: free slices of pizza, drinks, unlimited refills, 16 tokens for each kid. You can also double tokens if you make a reservation for ‘Double Token’ events. How to Benefit from ChuckECheese Coupons, Deals and Discounts? If you are a parent looking for best discounts for your kid at ChuckECheese, become a ChuckECheese Club member and sign up for their best deals and rewards online. You will receive exclusive news and rewards by email. Up to a 30% discount on your purchases and great token offers on your first coupon sheet. A ChuckECheese rewards calendar which is worth 10 free tokens. Exclusive access to the Chuck E. Story which is a digital book you can read to your little ones. Get members-only information, deals, news, kids’ activities and other perks. How to Become a ChuckECheese Club Member? Visit the Chuck E-Club registration page. Provide all the information you are required in the indicated fields. Mention your preferred ChuckECheese location. Click on ‘Next’ and follow their simple indications. If you are a regular ChuckECheese guest why don’t you provide them with a feedback and enjoy even more benefits at the same time? ChuckECheese is a company interested to provide great services, games and foods for best value. That is why they have created an online questionnaire to listen to their customers’ opinion and suggestions on how to improve their customer care. Find all the information you need on how to participate in the ChuckECheese survey in our post. Let them know what you feel about their services to enhance your guest experience and satisfaction when you next visit one of their locations. If you want to contact ChuckECheese, there are several ways to reach out to them. Fill out their online contact form if you have any questions or comment. Give them a call at 1-888-778-7193. They are available Monday to Sunday, from 8am to 5pm. If you are new to ChuckECheese and we have made you curious, access their website and find the nearest location to your place. You can easily do it by entering your zip code in the ‘Location Finder’ box at the top of their page. This concludes our information on ChuckECheese coupons, deals and rewards. For further information on how to register as a member and benefit from their discounts, please do not hesitate to drop us a message in the comment box below. We are happy to answer to your questions and always welcome suggestions and opinions from our readers. Sam’s Club is one of the biggest and well-known retailers in the United States, offering excellent products and services to millions of members at great discounts. Wonder how you can profit from Sam’s discount offers and benefits every time you purchase in one of their stores? All you need to do is become a member, apply for a Sam’s Club credit card and start enjoying exclusive offers and savings on their quality services and goods. Find out more about Sam’s Club credit card account application, benefits and deals in our post. We will provide essential information on how to register, how to make online payments and how to check and use your Sam’s club credit card balance wisely. What is the Sam’s Club Credit Card? Sam’s Club Credit Cards are a great opportunity to earn rewards and make savings as a member of this large American retailer. As you are about to find out, there are a great number of benefits and several types of Sam’s Club credits you can apply for. Get informed and choose the one that suits you best. Where Can You Use Your Sam’s Club Credit Card? The good thing about your Sam’s Club Credit Card is that you can use it in a variety of places: in Sam’s Club and Walmart stores and gas stations, plus other stores which accept this type of credit cards. What are the Benefits of Getting a Sam’s Club Card? There are many benefits of applying for a Sam’s Club Credit Card from saving money every time you shop to being informed on extra saving deals and discounts. Earn cash back rewards on purchases made with your Sam’s Club MasterCard. You can earn a maximum of $5,000 in Cash Back rewards in a calendar year. 5% cash back on fuel at Sam’s Club and gas stations. 3% cash back at restaurants and travel purchases. 1% cash back on other eligible purchases. In order to apply for a Sam’s Club Credit Card and profit from all the benefits they offer, you need to become a Sam’s Club member first and create an account. 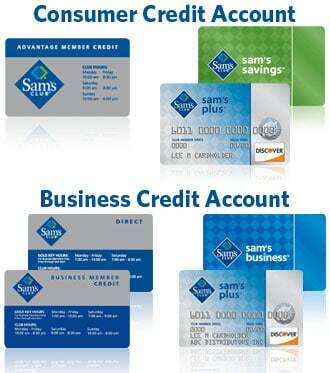 Visit the Sam’s Club Credit Card membership registration page. Fill out the fields for personal and account information, and update your profile. Click on Register to verify your membership account. Create a password and finish registering by following the indications provided on the screen. Consumer Credit (PLCC): accounts which begin with 7714. Consumer MasterCard: accounts which begin with 5213.
Business Credit (BRC): accounts which begin with 7715.
Business MasterCard: accounts which begin with 5560. Direct Credit: accounts which begin with 040. Requesting a credit line increase. Updating personal and account information. Receive information on special offers and savings. Be provided with financial assistance. Pay at Sam’s Club and Walmart stores nationwide. Add up to 8 authorized buyers for Sam’s Business members and up to 16 authorized buyers for Plus Members who own and operate a business. Earn cash back with Sam’s Club Discover/ MasterCard. Accepted payments in other locations as well. Visit Sam’s Club Credit Card registration page and follow four steps starting with entering your account number. Make sure you have your card handy as you will be asked to provide information found on it. Click on My Cards & Credit on the right-side of the page. Click on Check Shopping Card Balance. Enter the 16 digit number located on the back of your card. Enter the 4 digit PIN code. Click on the Continue button and see your card balance. Making payments online with your Sam’s Club Credit Card is also quick and simple. All you need to do is sign up to your SamsClub.com account by entering your email and password and choose the payment method you wish. From My Account Page, click on My Membership and then on My Payments Settings. Pay in store at the Sam’s Club Member Service desk or at Walmart stores. Your in-club payments are posted to your account the same day, but might take a longer time to be processed. Pay over the phone by calling the number located at the back of your card card. For additional information about Sam’s Club Credit Card, extra benefits and latest savings, please visit Sam’s Club Credit card website. You can also sign up for email updates on price savings, discount offers, new items, events and more. If you want to access faster your Sam’s Club Credit Card account, go directly to Sam’s Club Credit Card Services page. If you wish to contact Sam’s Club, you can reach out to them by phone, mail or email. Assistance by phone is available Monday to Saturday, between 7 am and 11 pm and on Sunday, 10 am to 8 pm. If you want to speak your mind about Sam’s Club services and products, you now have the chance to send them your feedback by completing an online questionnaire. Find out more about how to participate in Sam’s Club customer satisfaction survey in our post and don’t miss the opportunity to win one of the 5 $1000 prizes for Sam’s Club merchandise. This concludes our information on Sam’s Club Credit card deals. We hope these details will help you profit more of the benefits of using such a card. If you have any questions or thoughts to share about the registration process, please do not hesitate to leave a message in the comment box below. How often do you treat yourself with delicious Domino’s pizza? 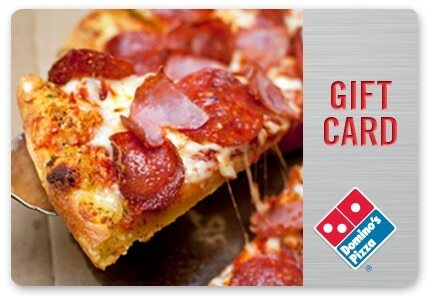 Now you can get a Domino’s gift card for you or for someone special and enjoy together some quality foods and drinks. Find out more about Domino’s gift card options, deals and offers in our post and enjoy the benefits of using one. Domino’s is the second largest American pizza restaurant chain, also known internationally as franchiser of pizza delivery services. Headquartered in Ann Arbor Charter Township, Michigan, United States, it operates more than 10,000 stores worldwide, in 70 countries. At Domino’s you can choose from a variety of products ranging from Domino’s Artisan Pizza, Stuffed Cheesy Bread, nice Oven Baked Sandwiches, Parmesan Bread Bites to mouthwatering Chocolate Lava Crunch Cakes. However, their menu offer varies from region to region to best meet guests needs. What is the Domino’s Gift Card? Domino’s gift cards are the ideal way to say Happy Birthday, Thank You, and Congratulations or simply to give the gift of pizza to someone you care about. Check out our information on how to receive and redeem one, view your Domino’s gift card balance and start enjoying its benefits. What are the Benefits of Getting a Domino’s Gift Card? Get your favorite pizza delivered without having to order it in Domino’s pizza stores. Check your Domino’s gift card balance online. Receive updates on latest offers and discounts. A Domino’s gift card is easy to purchase. You can either buy it from a Domino’s pizza store or order it online. Domino’s eGift cards are electronic alternatives to the traditional plastic card and can be ordered online and printed at home in a matter of seconds. If you choose this option, make sure that you’ll get a quality image of your card and that the card number is readable. If you wonder how you will know if your recipient got your gift, you will be notified by email that the eGift card has been viewed. You can also contact Domino’s Customer Support representatives and get informed if your friend has got his or her eGift card. In this case, you will need to provide the order number or purchaser email address. Otherwise, you can always receive or send a Domino’s gift card by mail. This kind of orders, however, require more time to be processed. Expect at least a few business days to pass until you get your card. Domino’s gift cards are only available within the United States. Visit the Domino’s gift card page. Choose the amount you wish to be spent. Choose the quantity of cards you want to purchase. Customize the gift card you intend to give by adding a personalized message, which is cost-free. Enter your contact details or the contact information of your recipient. Select the shipping modality of your preference or print it yourself in case it is an eGift card. How Does Your Domino’s Gift Card Work? Ordering a card can be quick and simple. Your most convenient options are to either purchase one in Domino’s Pizza restaurants or online. Unfortunately, Domino’s gift cards cannot be reloaded at this time. If you have spent all your funds, you will need to get a new one to further enjoy the benefits of using one. Domino’s gift cards or eGifts are redeemable for food and merchandise in over 5,000 stores across the States. These can also be used to make online orders at www.dominos.com. Ordering Domino’s pizza online for either pick up in stores or home delivery takes less than 30 seconds. All you need to do is visit their website and place your order. Have your card with you as you will be required to provide details such as your card number or pin code. If you choose to use your Domino’s gift card in store, present your card to the customer service representative in order to carry out purchases or order pizza for home delivery. Also, a Domino’s gift card cannot be redeemed for cash, check or credit, and it won’t be replaced in case it gets lost, destroyed or stolen. There are several ways to check your card balance. Check your Domino’s gift card balance in store. Check your card balance online by accessing this link. Before viewing your card balance, ensure you have your card handy as you will need to enter your card number. You may also be required to enter the pin number or access code for some orders. If you received an eGift you can follow the instructions on the page linked in the email notifying you of your gift card. If you want to be well-informed and updated with Domino’s Pizza offers and discounts, access their official website: www.dominos.com. Find out more about their menu and deals such as coupons, and find the nearest locations to your place. If you have questions concerning your gift card you can always contact the merchant that issued your card or a Domino’s Customer Support representative. Reach out to Domino’s either by phone or email. Domino’s Gift Card Phone Number: 1-877-250-2278. Domino’s Gift Card Email Address: dominosegiftcardsupport@cashstar.com. eGift Card Customer Support Page. In order to receive assistance effectively, make sure you have your card number or order number handy. You will be also asked to give personal details such as name, purchaser email address, or phone number. This concludes our information on Domino’s gift card deals, ordering options and how to check your Domino’s gift card balance. Give the gift of pizza and enjoy some time with your friends in your favorite pizza restaurant. For further questions about the ordering process, or comments on your customer experience, please leave us a message in the comment section below. We encourage our readers to reach out to us and share their thoughts and opinion. Walmart is one of the largest retailers in the US operating more than 8,500 stores in 18 countries. Not only they offer a wide range of products, from electronics to furniture and grocery, but they provide their customers with convenient and safe payment methods. Walmart credit card services allows you to pay for purchases at any Walmart store or every time you shop online at Walmart.com easier and faster. If you apply now for Walmart Credit Card, you will save $25 you can spend on your favorite products. Want to learn more about the Walmart credit card application, benefits and payment methods? We will cover everything you need to know about Walmart credit card services in our post, from how to register and make payments online to how to check your Walmart Credit Card balance. What Are the Walmart Credit Card Services? Walmart credit card services are meant to respond to your customer needs in a more enhanced manner. They refer to the opportunity to apply for a Walmart Credit Card or a Walmart MasterCard you can use in stores or for online payments. Get a $25 statement credit when you apply for a Walmart Credit Card. Hurry up! The offer is valid until December 31, 2015. Have no annual fee to care about. Save at the gas station: 5¢ per gallon discount available each time you use a consumer Walmart Credit Card as payment type. Fraud protection from unauthorized charges. Check your transactions and electronic statement. Special financing advise and offers in stores. Earn $5 for every $500 you spend in Walmart stores. Walmart MasterCard is accepted not only in Walmart stores, but also at Sam’s Club, Neighborhood Market and other locations. EMV chip that offers greater protection against fraud. In order to be provided with Walmart credit card services you need to create a Walmart.com account first. Creating an account is free and easy and gives you access to a variety of benefits. All you need is a device that enables Internet connection and a few minutes of your time to complete the registration process. Visit the Walmart Credit Card page. Click on ‘Apply Now’ and check the ‘New Online Customers’ Section. Click on ‘Create an Account & Apply’ in order to complete the credit application. Next, you will be required to fill out an application form with personal details such as full name, email address, zip code. You will also be asked to enter your Social Security Number. Submit your Walmart Credit Card application by clicking on ‘Accept and Submit’. If you are approved, you may now access your Walmart Credit Card login page. Enter your user ID and password and activate your card by clicking on ‘Activate my Card’ below the ‘Sign In to Your Walmart Credit Card Account’ box. Your Walmart Credit Card balance refers to all transactions made since your last statement and can be easily checked online. Access your Walmart.com account, and check your current balance from the ‘Account Summary Page’. In order to make a Walmart Credit Card online payment you need to sign in to your Walmart.com account. Normally, it takes 2 – 3 business days for your online payments to post to your account. If you do not have a Walmart Credit Card yet you can still pay for your online shopping using other payment methods. Bank routing number (this refers to the first nine numbers found at the bottom of your checks). There is the option of paying online through CheckFree as well. You will need to register for a CheckFree account. Paying by phone is free if you use the automated payment methods. However, if you need assistance over the phone, you will be charged with $10. Before calling, make sure you have your checking account information handy to save you time. For an additional convenience fee you can pay by phone with your debit card using a service called Speedpay. Any Walmart store will offer you the possibility to make a payment to your account at the Customer Service desk. Please take note that payments made in stores will be posted to your account within 48 hours of the transaction. Also, ensure you have Walmart Credit Card or Walmart MasterCard statement with you for processing as they cannot search for your account in stores. For additional information about Walmart Credit Card services and benefits check the Walmart Credit Card Services Page. If you wish to be sent the latest Walmart saving offers by email, you can sign up for their online newsletter. Also, for faster access to your Walmart Credit Card account, go to the Walmart Credit Card Login Page. Need assistance? Walmart representatives are there to answer to your call 24 hours a day, seven days a week. If you are a regular Walmart customer and want to let them know what you think about their service and products, participate in the Walmart feedback survey and get the chance to win a $1000 Walmart Gift Card. Find out more about how to complete the survey here. This concludes our information on Walmart Credit Card Services. We hope our post is useful to you. If you have further questions about the application process or want to share your thoughts with us, please leave a message in the comment box below. Do you enjoy dining at the Applebee’s Neighborhood Grill & Bar? Why don’t you get an Applebees Gift Card and enjoy even more benefits and delicious discounts? We we’ll answer to all the questions you might have in mind. What is the Applebee’s Gift Card? The Applebee’s Gift card is your chance to ‘give the gift of deliciousness’ to someone you care about or even to yourself. Visit one of the Applebee’s Neighborhood Grill & Bar locations or their official page and get one now. We will provide you with all the information you need on how to order and customize one, how to check your Applebee’s gift card balance online and what card deals and discount offers are there for you in the sections below. What are the Benefits of Ordering an Applebee’s Gift Card? If you wonder what the benefits of getting an Applebee’s gift card are, let us reveal the tasty advantages you can get. Apart from enjoying good quality foods and beverages at your favorite neighborhood hangout, buying $50 or more in Applebee’s gift cards we’ll bring you a free $10 Digital Bonus Card. Applebee’s cards can be used in over 1,900 locations across the United States with no fees and expiration limit. However, you should check the bonus card or gift card for any restrictions that may apply to them. Now you have more reasons to get an Applebee’s gift card for someone special and enjoy together delicious salads, tasty steaks, mouthwatering flavors or healthy dishes at your favorite grill & bar place. There are two convenient ways to order an Applebee’s gift card, either for yourself or for a friend. First option is to purchase gift cards at any Applebee’s Neighborhood Grill & Bar location. Second, and most optimal way to get a gift card from wherever you are is to use the Applebee’s online ordering system. In this case the card will be emailed or mailed to you, according to the delivery modality you prefer. There are also two types of Applebee’s gift cards you can buy: digital and traditional plastic ones. If you order a physical, plastic card this will be shipped to you the following business day. There are different shipping options to respond to your needs, from standard mail to overnight delivery. If you do not necessarily want a plastic card, digital Applebee’s gift cards can be sent to you immediately by email once you have purchased one directly from the Applebee’s website. This needs to be printed by you after receiving the confirmation email. Visit the Applebee’s Gift Card page at applebees.com/gift-cards. Click on ‘Order a Gift Card’. Next, four options we’ll appear on your screen: E-Card, The Card, Gift with Friends and Bulk Gift. By clicking on E-card you will be sent to the page you can design your digital gift card and add a personal message to it according to the occasion you have in mind: Seasonal, Happy Birthday, Thank You, Just Because. ‘The Card’ option will take you to the plastic gift cards ordering page, where you can personalize your Applebee’s gift card with special designs and messages as well. The ‘Bulk Gifts’ option is designed for ordering large quantities of Applebee’s gift cards. This is suitable for companies and firms who wish to buy something special for their employees. In order to order a massive amount of gift cards you are required to create an account. For any of the options above, you will need to choose the amount and preferred delivery modality (mail or email) once you have selected a design and added a message. The fourth option – ‘Gift with Friends’ – allows you to choose Applebee’s special items you want to share with friends. Select foods and beverages for your gift, personalize the gift cards with message, photo, and video, pay with a credit card and your gift will be sent via email or Facebook. There’s also personal information you have to provide such as name, email or mailing address of the recipient. Check your email within a few minutes or your mail box within a couple of days and enjoy or share the Applebee’s deliciousness. Applebee’s gift cards are suitable for diverse occasions, from birthdays to special celebrations. You can customize the Applebee’s Gift Card design with an image, audio, or mobile phone messaging. Choose the gift card design suitable for your special occasion. Select the amount you want your recipient to spend at the Applebee’s. You can send an Applebee’s gift card via email, mail or Facebook. According to the Applebee’s official gift card page, gift card orders that do not exceed $200 can be shipped to any United States address. As regards digital card orders, there’s no amount limit. You will be required to provide personal details and choose the most convenient shipping option for your recipient after customizing the Applebee’s gift card. How Does Your Applebee’s Gift Card Work? Once you have ordered an Applebee’s gift card you can use it in 1,900 Applebee’s Neighborhood Grill & Bar locations. Sadly, Applebee’s gift cards cannot be reloaded or revalued. If you run out of the amount chosen at the beginning, you we’ll need to purchase another one. Good news is that you can select a bigger amount as the Applebee’s Gift Cards never expire or decrease in value over time. How to Check Your Applebee’s Gift Card Balance? Go to the Applebee’s gift card page. Click on the ‘Check Balance’ button on the right-side menu. Enter the 19 digit card number. Enter a security letter combination provided on the screen each time you visit the page. Check how much deliciousness you can enjoy by using your Applebee’s gift card by simply clicking on ‘check balance’ again. If you are a regular Applebee’s guest and want to share your opinion about their services and foods, take their guest experience survey. Check out our guidelines for completing the online questionnaire and enjoy even more benefits. This concludes our information on Applebee’s gift card deals and rewards. We hope this post is useful and clear to you and help you profit from discount offers and free foods. If you have any questions about the registration process, or any thoughts you’d like to share with us, please drop us a line in the comment box below. If you are a regular Burger King customer, why don’t you get a Burger King gift card either for you or a friend and enjoy together their tasty and affordable foods and drinks? Burger King is a renowned fast food restaurant chain, operating thousands of stores worldwide. The company is committed to provide excellent products at affordable prices. Over the last five years customers have been given the opportunity to share their Burger King dining experience by means of gift cards. Learn more about Burger King gift card deals in our post and profit from their discount offers and promotions. What is the Burger King Gift Card? The Burger King gift card or BK Crown Card offers you the opportunity to share with friends the Burger King experience. Thanks to today’s technology, you can make a gift to someone special in a single click. Burger King gift cards come in digital form as well, and can be easily used not only as a personal treat, but also as a business gift. The electronic version of the Burger King Crown Card is called Burger King eGift and can be purchased online or received as a prize in connection to Burger King promotions. Make sure you follow their promotional activities and fresh offers either on their website or social media channels. What are the Benefits of Getting a Burger King Gift Card? Getting a Burger King gift card is a nice and simple way of saying Thank You or Congratulations to a friend or even of treating yourself with delicious Burger King products. Once you have received a Crown Card you can try a variety of Burger King Menu items, from burgers to salads and breakfast options, without having to carry cash with you or using your credit card. Plus, having a Burger King gift card keeps you updated with Burger King news and deals if you register it online. Interested on how to profit more from the Burger King offer? As a company interested in providing best services for its guests, Burger King has created a customer feedback survey. By completing it online you receive a coupon which can be redeemed at any of their stores. Find out more about how to participate in the survey in our post. Burger King gift cards can be purchased either from a Burger King restaurant or can be ordered online. 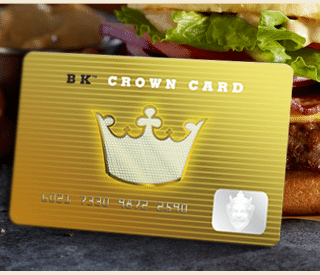 Visit the Burger King gift card page at bk.com/crowncard. Choose the quantity of cards you want to purchase (you can buy up to 100 cards without having to contact a Burger King representative). Enter the contact details of your recipient. Select the shipping modality you prefer. What you should know is that you cannot select an amount higher than $500 when you purchase a card online. If you want to maintain the card amount to $500 or over, you will need to visit one of the Burger King locations and obtain a gift card in person. There are two sending options you can choose from. Order a Burger King eGift online and have it send via email or Facebook in a matter of minutes. You can also select the date of the purchase and have it sent for a special occasion. If you are looking for something more conventional, such as a plastic Crown Card, have it shipped. Allow Burger King around three days for processing and shipping your order. How Does Your Burger King Gift Card Work? Ordering a Burger King Crown Card is fast and simple. All you need to do is access the Burger King gift card page, select the amount you want to spend and wait for it to be delivered within a few business days by post, or in a few seconds by email. Once you have received a Burger King gift card, you can register it online by creating a personal account. In order to do so, access the Burger King official website and follow the instruction provided by them. You are advised to register your card because if it gets lost or stolen, you can report the unfortunate event and your balance will be protected. This way, your funds will be transferred to another card and you will be able to spend your remaining amount. No refunds will be provided otherwise. There are also other benefits to consider apart from freezing your funds in case the card is lost or stolen, such as receiving Burger King news, discount offers, coupons and other deals. By registering an account, you can reload your Burger King gift card. In order to reload your card online you need to use a credit card. The reloading process is highly protected from fraud. Ensure you enter the correct information provided on your credit card, entering the exact letters (uppercase/ lowercase), punctuation, abbreviations found on it. If you wonder how to use your Burger King gift card, the only thing you need to do is present it to the cashier at a Burger King restaurant from the US when you want to purchase one of their items. They will see what balance you have available and check if your purchase is the subject of any restrictions. The Burger King gift card cannot be redeemed for cash. As regards Burger King eGifts, they are received as a 16 digital code via email or Facebook and should be shown to a Burger King crew member either on your smartphone or in printed format. Unfortunately, the Burger King eGift is not reloadable. You can check your Burger King gift card balance online easier than you imagine. Find out how much you can still spend on juicy burgers and refreshing drinks by simply accessing the Burger King gift card page. Search for card balance, and insert all the information you are asked such as name, card number, security code. This concludes our information on Burger King gift card deals, ordering options and how to check your Burger King gift card balance. Make a surprise to a special friend, enjoy together some delicious foods and drinks and profit from the BK fresh offers and discounts. For further questions about the ordering process, please leave us a message in the comment section below. We will happily get back to you as soon as possible. Are you looking for unique gift ideas and rewards? Send a personalized Starbucks Gift Card to someone special. It is a simple, caring gesture that will make anyone smile. Also, by registering a Starbucks account you can get a Starbucks Card for yourself and enjoy more benefits and discount offers. Registering online is free and easy, and gives you the opportunity to check your balance online and reload your card in a single click. We all know that at the foundation of Starbucks coffee houses is sharing good coffee and fine, delicious pastries with friends. Sending Starbucks gift cards is your chance to share and enjoy the Starbucks wonders with someone you care about. Find out everything you need to know about Starbucks card deals in our post. The sooner you get one, the more is there to profit from. What are the Starbucks Gift Cards? Starbucks Gift Cards are a thoughtful way to show your friends what they mean to you. By accessing the Starbucks official website you can either buy a card or send it by email or mail. Starbucks eGift Cards are a digital alternative to normal cards, made available faster to your recipient. Saying Thank You, Happy Birthday or Congrats has never been easier now that you can customize the Starbucks gift cards you give. How to Give Starbucks Gift Cards? 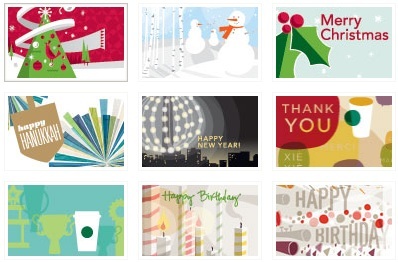 Choose the appropriate Starbucks Gift Cards design for your special occasion (Father’s Day, Graduation, Lunar New Year, Love, Baby, Wedding etc.). Add a personal message and amount you want your recipient to spend. Choose the delivery modality you prefer (by email or by mail). If you want to send it by email insert your recipient’s email address and that’s it. If you like planning ahead, you can set the delivery time for future occasions up to 12 months in advance. Starbucks Gift Cards can be sent any time and we’ll be received within minutes. 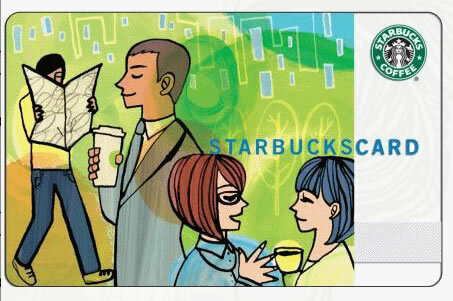 Once received, Starbucks Gift Cards can be used in any Starbucks store or transferred to an existing Starbucks Card. You can also earn free drinks and foods by registering an account for a personal Starbuck card. We will provide you with all the information you need to start profiting from Starbucks card deals. Learn how to sign up, check your balance online and enjoy some discount offers. How Can You Get a Starbucks Card in the First Place? In order to get a Starbucks card you need to create a My Starbucks Rewards account. Registering online is free and easy. Type your first name and last name, as well as your email. Start earning Start each time you purchase Starbucks products. More starts will bring you more rewards. What are the Benefits of Registering a Starbucks Account? How Does the My Rewards Starbucks Account Work? Once registered, you can check balance (view your stars), reload your card, view your transactions history, register multiple cards and transfer funds between them. Sharing a free drink with someone special is now possible through ‘My Starbucks Gift to You’ option. Through this new gifting option you can transfer your rewards online and make someone smile in just one click. What is more, by creating a Starbucks account not only you can manage your Starbucks Card balance, but also protect it in case your card gets lost or stolen. One of the special options is creating a Corporate Card Account which allows you to order Starbucks Cards for your business. Those interested in ordering a large quantity of cards benefit from volume discount, as well as from unique corporate designs including a personalized logo. Register now and start earning stars. Enjoy the Starbucks Card benefits and share your joy by offering Starbucks Gift Cards. You can track your Starbucks card balance online. In order to do so, you are required to enter the card number and security code found on the back of the card. You can also download the Starbucks Application to pay for purchases easier, view your rewards and have access to current discount offers. Also, if you sign up for emails you will be informed on each reward earned. If you are a regular Starbucks customer and already have a Starbucks card, why don’t you let them know what you think about their service and products? Participate in the Starbucks customer survey and enjoy even more benefits. Find out everything you need to do in order to complete the survey in our post. This concludes our information on Starbucks Gift Cards, Starbucks account and card deals. We hope these guidelines prove useful to you and help you profit from Starbucks deals, discount offers and free drinks. For any questions or thoughts about the registration process, leave us a message in the comment box below. We’ll get back to you as soon as possible. 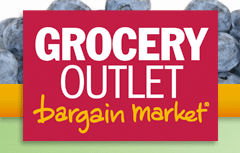 If you are an opportunistic shopper, Grocery Outlet is the ideal store for you. Grocery Outlet Inc. is a supermarket chain founded and operated by the Read family. The company is also known as one of the largest value grocery retailers in the US, offering products at up to 60% off retail prices. Grocery Outlet was founded in 1946 in San Francisco, California, by Jim Read. It currently operates outlets in seven states including Oregon, Washington, Idaho, Nevada and Pennsylvania. These are independently managed by locally based families, each offering services and products that best meet local needs and requirements. As a general feature, Grocery Outlet is a company focused on discount prices and bargain products. This vision belongs to Jim Read, who started this family business by selling military surplus for major discounts. So their mission is to deliver the best deals available on the market. 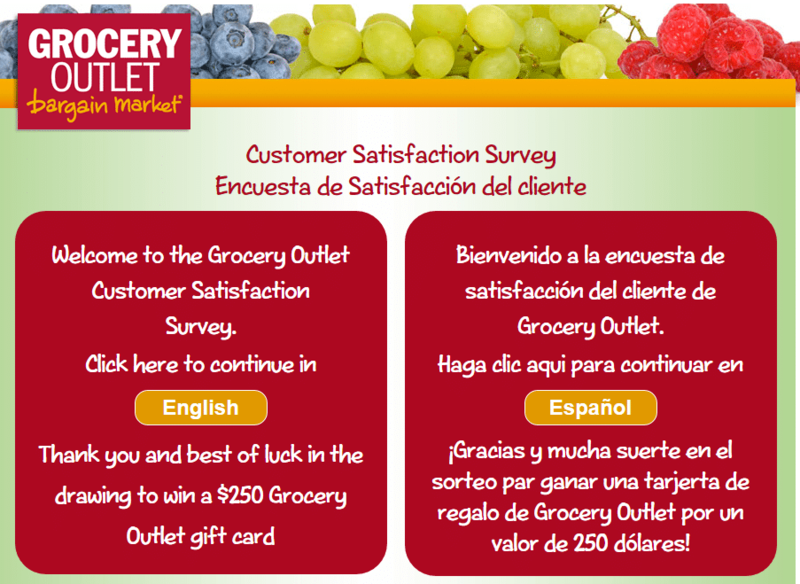 If you have visited one of the Grocery Outlet locations recently, why don’t you share your shopping experience? The company created an online survey to enable your opinion reach out to them. Your customer satisfaction evaluation will help them provide you not only with great prices and discounts, but also with a courteous customer service. Feel free to comment on their range of products and quality of staff. This way they will have the opportunity to improve their customer care and product offer according to your needs and previous experience. The online questionnaire can be completed by simply accessing www.go-opinion.com. Your feedback is much appreciated. Wonder how you can be rewarded for participating in this 10-minute survey? Sharing your assessment gives you the opportunity to enter the drawing for a $250 gift card every month. Access to the internet through a device like laptop, smartphone, tablet or PC as you will have to visit their survey page go-opinion.com. A recent Grocery Outlet receipt. About 10 minutes of your time to deliver your appreciation of their services and product offer. 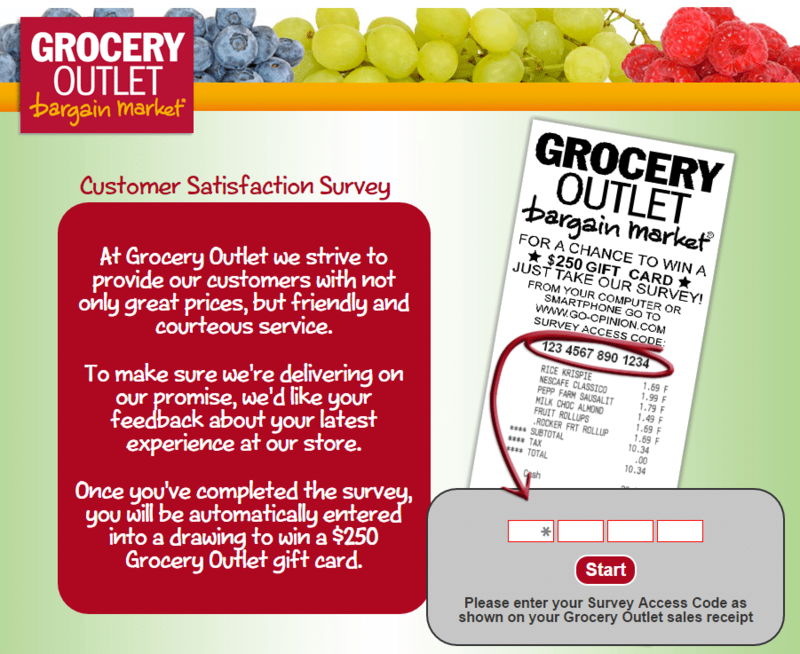 How to participate in the Grocery Outlet Customer Satisfaction Survey? Here’s what you have to do in order to successfully complete the survey and get the chance to win a $250 gift card. Choose the language of your preference. Enter the 14-digit Survey Access Code located on your receipt. Next, you will be asked to answer to a series of questions regarding their customer care. First, rate the likelihood of shopping again at the store you’ve recently visited. 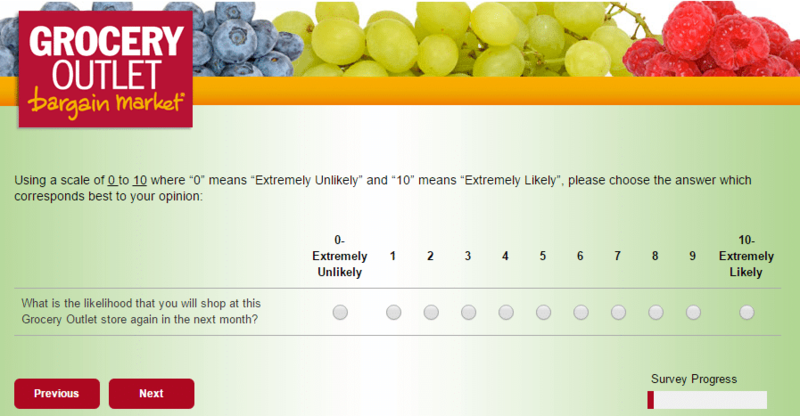 Use the scale of 0 to 10, where 0 means ‘Extremely Unlikely’ and 10 means ‘Extremely Likely’. 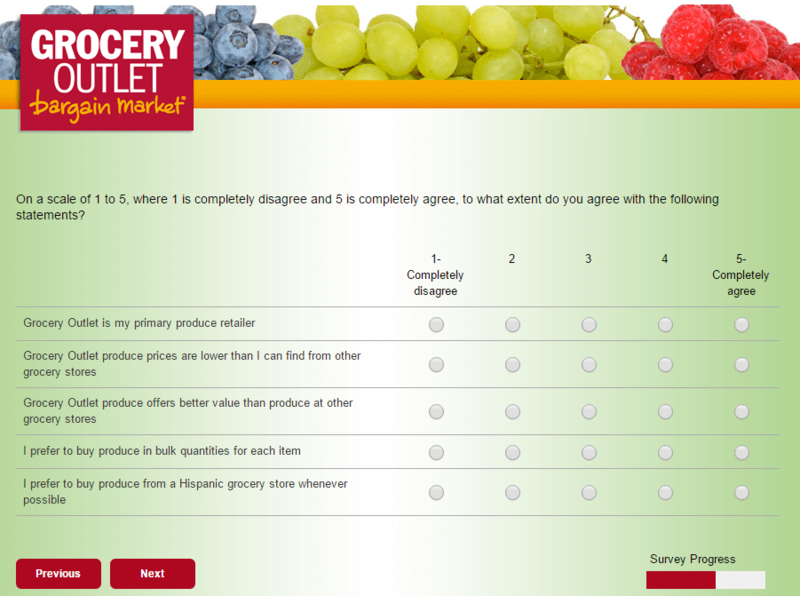 Then, you will be asked to rate your overall satisfaction with Grocery Outlet customer service based on your latest shopping experience. Indicate the level of satisfaction on a scale from ‘Very Unsatisfied’ to ‘Very Satisfied’. You will be asked if you needed any help during your visit. 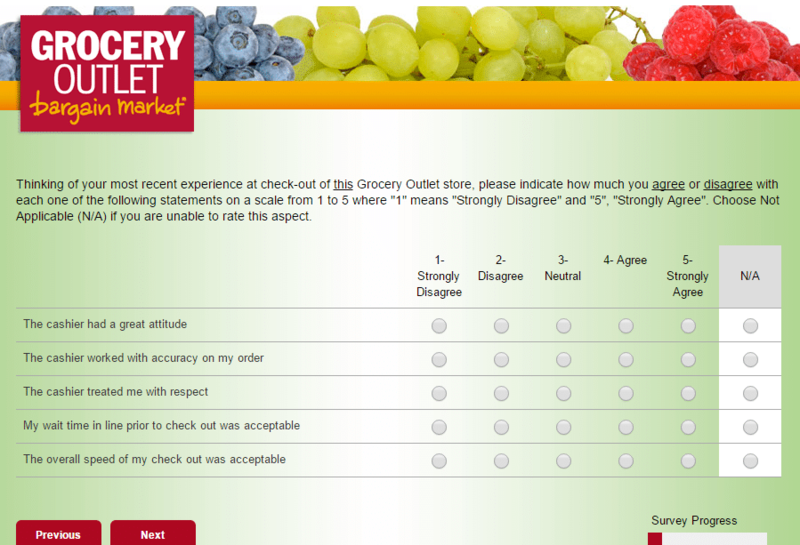 Also, you can rate the way the cashier treated you at check-out as well on a scale from 1 to 5. Other questions will refer to the cleanliness of the store and the quality and display of products. 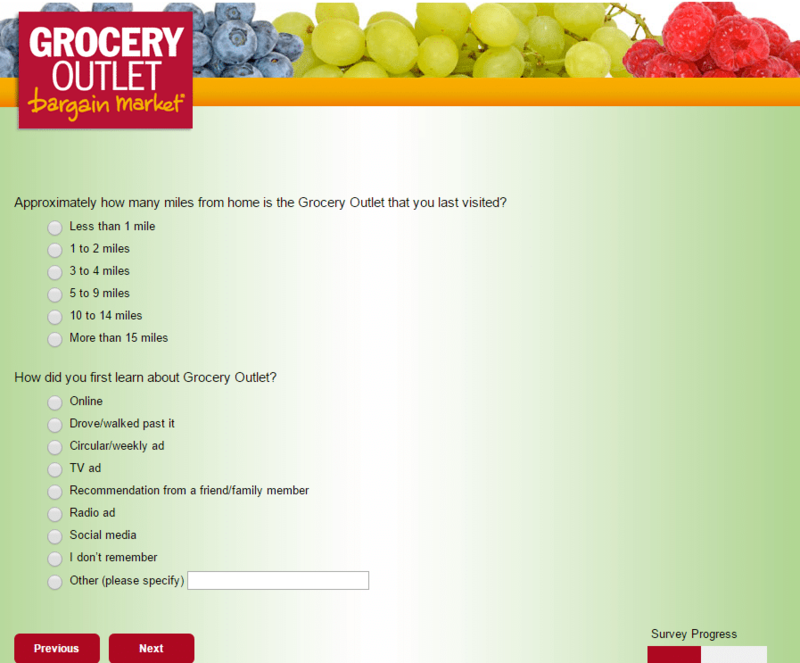 The company also wants to know about how far you traveled to do shopping in one of the Grocery Outlet locations and how you learned about the supermarket. The next set of questions refer to special products, like organic, specialty and healthy products, as well as to the importance of their availability. 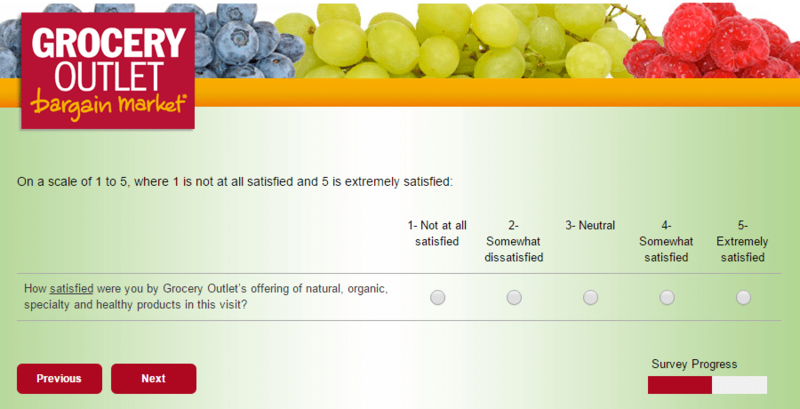 You can rate how satisfied you were by their offer. Also, you will be asked about the products value. For classification purposes, you will need to provide your zip code. Following this question, you will be required to provide a few more details about yourself, such as gender, age, annual income and ethnicity. Next, you will be required to leave your feedback, either good or bad. Help them improve your shopping experience. Then, you can choose to receive information about promotions or other specials through email. You will also be required to leave your personal details including your name, phone number, email and mailing address. 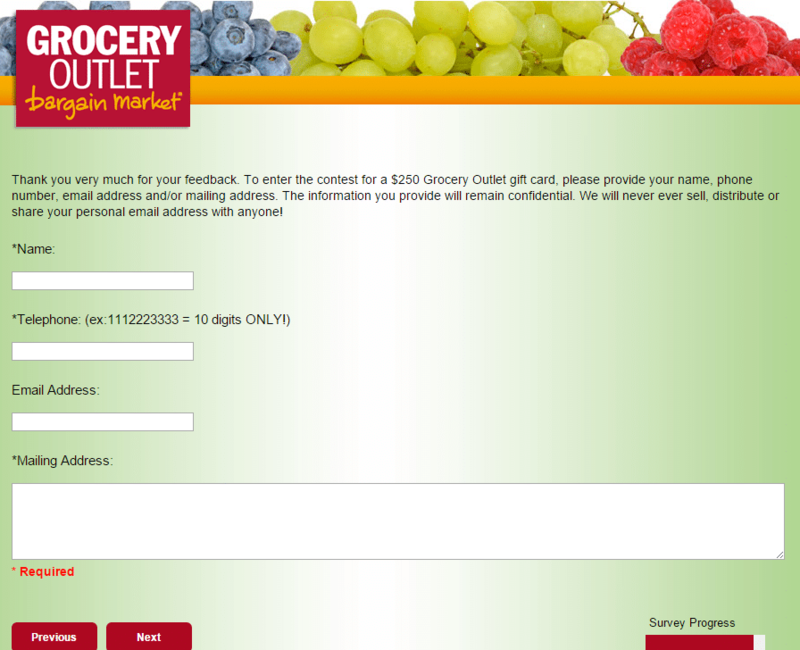 This way you can be contacted back in case of winning the $250 Grocery Outlet gift card. At the end of the survey, this is what should appear on the screen. By visiting their official site, you will be provided you with more useful information about promotions, Grocery Outlet coupons and other offers. Access the link to complete the survey. Your opinion is valued. Incentive: By participating in the Grocery Outlet survey, you enter the monthly drawing for a $250 Grocery Outlet gift card. Are you anxious to find out which is the nearest store to your place? Go to Grocery Outlet website and click on ‘Find Store’ at the top of the page. Enter your location (city, zip code, or region) and let the store locator do its job. Each store operates independently. That is why the Grocery Outlet hours may vary. We recommend you to find the store that interests you and give them a call to find out the exact hours of operation. For customer support, you can access their contact page and fill in a contact form. Before adding your comment or question, you need to enter your full name and email address. Social Media is another option for you to share your review and customer experience. 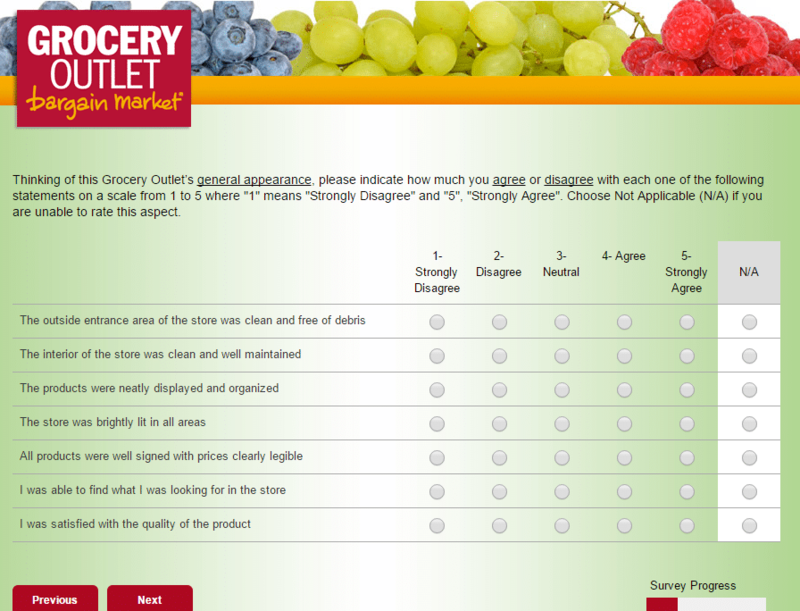 This concludes our information about the Grocery Outlet Customer Satisfaction Survey. If you have any questions, thoughts or concerns, please drop us a line in the comment box below. Subway is a very popular fast food restaurant franchise which specializes in salads and submarine sandwiches. Recent statistics show that it is the largest growing franchise in the United States, with over 43.035 locations in 110 countries. The company’s headquarters can be found in Milford, Connecticut but there are also additional five regional centers that support the franchise’s operations in Europe, Asia and Latin America. As far as menu goes, Subway’s best-selling sandwich is the B.M.T., with ham, salami and pepperoni. Variations may appear in the menu, depending on religious requirements or location, but most franchises have to respect strict rules in regards to ingredients, preparation and serving. If you enjoy Subway sandwiches, or you have a suggestion to make related to their services you might want to fill out the customer satisfaction survey on www.tellsubway.com. Subway takes the feedback from its users very seriously and it will use it to improve products and services. Because there are thousands of locations worldwide it can be difficult to keep track of performance everywhere. This is why the company is eager to find out what it can do to offer better services. Tell subway.com how you feel about their company with the help of their feedback questionnaire. All you have to do to complete it is to have a valid receipt from the store. Let’s get started. You can visit the official website and click on the survey link to select your preferred language. Once you have accessed the survey page you must submit your SUBWAY store ID from the receipt. You will be redirected to the survey. The first thing you must type in is the date of your receipt and the type of payment you used. Most of the questions address your experience in the store. You will see questions like ‘How likely are you to recommend Subway to a friend?” or “How satisfied were you with each of the following items’. Depending on your answers, new question modules will appear. This usually happens when you say that you are not satisfied with a service. The new modules will enquire about the reasons you weren’t satisfied, for example, background noise, general comfort etc. At the end of the survey you will also be asked if you want to receive important information about the restaurant via e-mail. The email will also be used for the “Thank You” reward code. Once you are done with the survey you can click on the complete button. 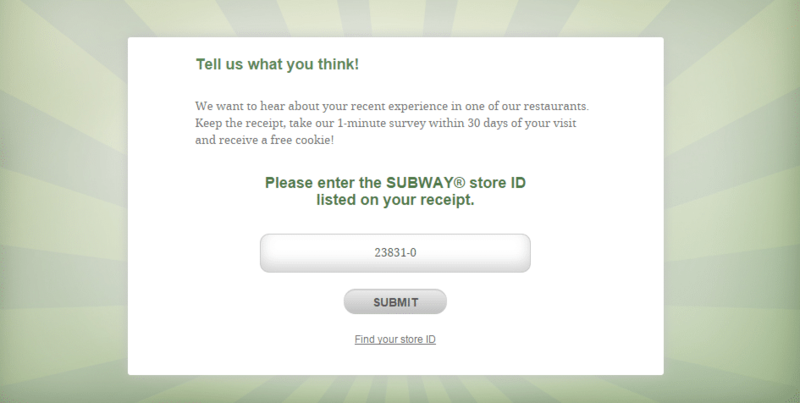 Write the “Thank you” Code on your receipt and go to the nearest Subway store to receive a www.tellsubway.com free cookie. 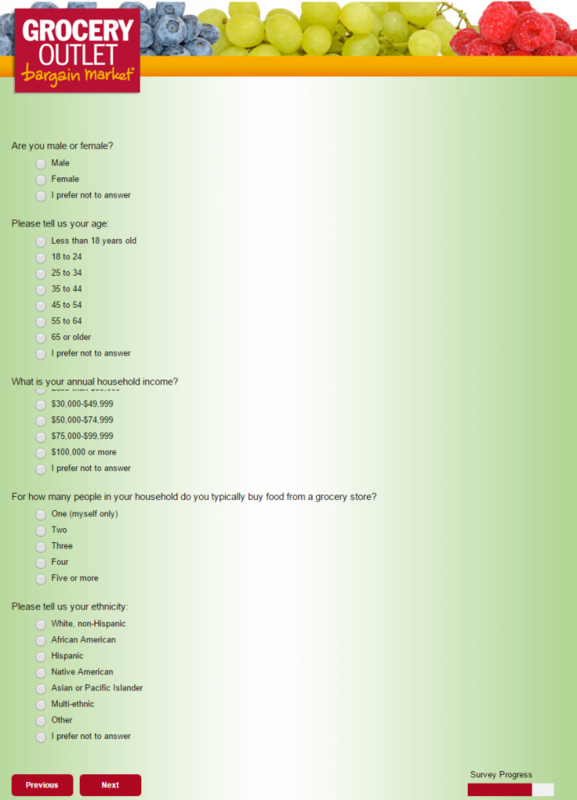 Subway has one of the fastest and easiest surveys. Laptop/PC experience: 5/5 stars – the loading time for the survey was under a few milliseconds. It works across any type of browser and it takes less than 15 minutes to complete. Smartphone experience: 4.5/5 stars – the survey is compatible with smart-phone devices. Load time is good on smart-phones as well. The only slight discomfort we found was in submitting the date and receipt code. Tablet experience: 5/5 stars – www.tellsubway.com works perfectly across tablet devices. The site is fully responsive across tablets. If you are interested in more deals and offers from Subway restaurants you should definitely join the Eat Fresh Club. Members of this club will regularly receive Subway Six Inch Sub and Drinks for their birthdays and other interesting offers. The steps to joining this service are extremely simple. Click here to find out more. While filling out the survey you should not click on the forward or back buttons of your browser. This will make it impossible for the feedback form to record your data. Only use the buttons provided within the survey. Contact form: the Subway customer service contact form can be accessed here. You will have to submit your personal details, store location and message to complete the process. Email: you can also contact the company directly through its email at franchieseoopportunities@subway.co.uk. Any inquiry related to the franchise can be submitted through email. Phone numbers for U.K. and Ireland: The U.K phone number is 0800 0855058 and the Republic of Ireland number is 1-800-413-076. Other phone numbers can be found on specific franchise websites. There should be a phone number available for each store and country. Other contact details: to find more contact details you can simply Google ‘Subway + location/country”. There is no mailing address available for the company at the moment. 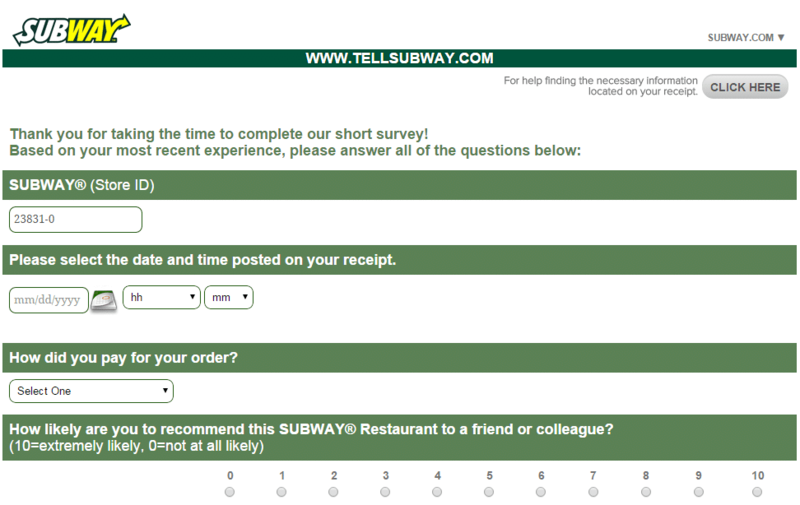 This concludes our article on the www.tellsubway.com customer survey report and Subway customer service number details. Have you already completed the Subway.com survey? If so, can you review the process? We would love to hear about your opinions on Subway’s feedback form and quality of customer service.